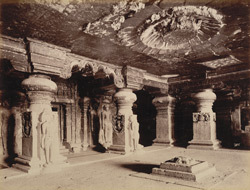 Photograph of the interior of the Indra Sabha Cave, at Ellora from the Curzon Collection: 'Views of Caves of Ellora and Dowlatabad Fort in H.H. the Nizam's Dominions' taken by Deen Dayal in the 1890s. The spectacular site of Ellora, in Maharashtra, is famous for its series of Buddhist, Hindu and Jain cave temples excavated into the rocky façade of a cliff of basalt. The works were done under the patronage of the Kalachuri, the Chalukya and the Rashtrakuta dynasties between the sixth and the ninth centuries. Indra Sabha is the largest of the Jain series and was excavated in the ninth century under the Rashtrakuta patronage. The cave is double-storey and is excavated in the rear of the courtyard. The interior of the cave has a columned mandapa or hall with niches on the three sides and the sanctuary in the middle of the back wall. The columns have rectangular shafts with exuberant foliate and garland motifs and cushion capitals typical of the last phase of Ellora architecture. Large figures of the Jain Tirthankharas are carved on the walls.